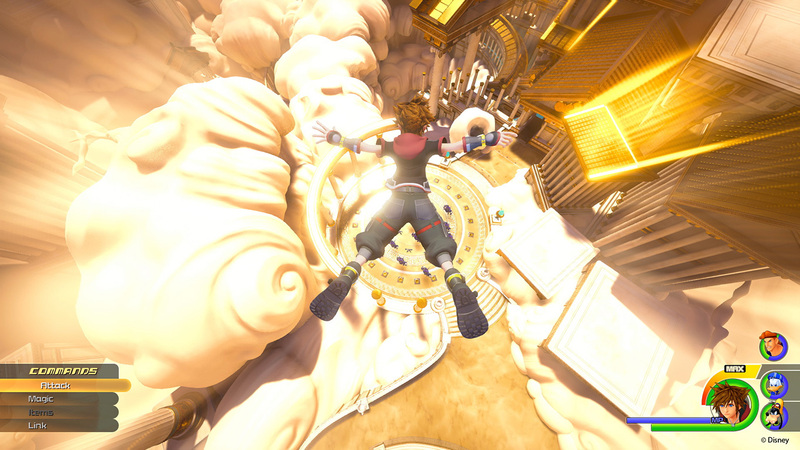 Daily Mirror had the opportunity to interview Tetsuya Nomura at D23 Expo this past weekend about KINGDOM HEARTS 3 and its development. Nomura declined to say what percentage of completion KH3 is at with its development because it's difficult to gauge with just a number. However, they do have everything planned out and are proceeding accordingly, which is why they could confidently announce the release window of 2018. Regarding the inclusion of characters from other Square Enix properties such as NieR and Dragon Quest, he explained that while it's not impossible, it's also not something he's actively seeking to do due to the large number of original characters that already exist. If the opportunity arises, it's certainly worth considering, but it may not be worth including new characters if they cannot fully commit to them. Nomura is also asked about a common trait in his character designs: the belts and zippers. While that was his preference around 15 years ago, he's not particularly conscious about adding them these days. In fact, it was because people teased him so much about the belts and zippers that he sought to include them even more! Nomura admits he's the type of person who will not back down when confronted and will double-down instead. If people try to provoke him by saying "Kingdom Hearts 3 is being delayed", he jokes that he may actually try to delay it. Read the full interview on Daily Mirror. C'mon guys let's all try and get KH3 delayed! But people will probably still do that with the 'teasing' so it's the saying never poke a sleeping bear? Nomura, stop joking and bring Sephiroth back. 13 years old me still waits to see Sora legit defeating him. LOL god Nomura is such a tool (in a good way....kind of? LOL). Honestly I feel like this is just his way of fool-proofing in case it actually does get delayed...like "haha gotcha it's getting delayed because you guys kept annoying me about it (but really we need more time so I'm delaying it)"
I genuinely think that Nomura is serious with that. Plus, Cloud and Sephiroth's arc was resolved in Kingdom Hearts II. No point in dragging that even further. It was? Sephiroth is still haunting Cloud. We didn't even see if Cloud beat him in KH2. Plus if you take what happened to Zack in consideration, no way is that story arc complete. Who cares about Cloud in KH. That tool is not even Cloud, it's Vincent with a wig. KH started a Sora - Sephiroth routine that I want to see to completion. Some stuff is left to interpretation. You can argue the same thing about Tifa's disappearance too. Final Fantasy characters serve as nothing more than cameo characters with occasional intertwining with the main plot, but they're really not a big deal in the grand scheme of things. Aside from the fact that I think explaining almost all there is to know about Heartless, Keyholes and Ansem to the hero, not to mention installing the right gummis to reach new worlds are kind of a big deal in the grand scheme of things, that is not that relevant when talking secret bosses. I'd like to see Sephiroth back, main plot and Cloud be damned. By far one if not the most popular characters of the FF franchise according to many polls, powers that were well implemented in the series, and became a staple many are fond of. If Nomura thinks he shouldn't be here for this game, he really misread an opportunity for a recurring trope and will smash more than one's childhood hopes. That kind of comparison is apples and oranges. It's the whole Laguna Loire situation from in Birth by Sleep again. Laguna could have been in Birth by Sleep, but because he was selected for Dissidia 012, he was omitted. Judging from Nomura's response in the interview, him and his team seems fairly reluctant of adding back Sephiroth. And when you really think about it, he's also the current director of Final Fantasy VII Remake too. He sees Kingdom Hearts III and Final Fantasy VII Remake as entirely different projects, so I don't blame him for not wanting to integrate Sephiroth into Kingdom Hearts seeing as he's developing the character for the Final Fantasy VII Remake. The twitter mentions for khi about this article is ridiculous. Y'all have joked about delays for years, especially when there wasn't even a release date to delay and when Nomura jumps on this bandwagon it's suddenly "too far" and "this joke is in poor taste", as if every single delay joke so far hasn't been in poor taste. SMH!! Final Fantasy characters serve as nothing more than cameo characters with occasional intertwining with the main plot, but they're really not a big deal in the grand scheme of things." "Leon and the others a really important tho"
Can't help but feel some leaps in logic. I didn't compare Leon to Sephiroth if that's what you meant, merely proving FF characters aren't just cameos. Personally, I would love to see Sephiroth, Cloud and Tifa's story wrapped up in KH at some point, but not at the expense of losing time for the main plot which already has a LOT it needs to accomplish. I wouldn't mind seeing that subplot patched into the game later on in a Final Mix DLC pack, seeing as how Sephiroth was Final Mix only in KH1 for Japan. We only got him and the other secret bosses because of how long the localization time was. Noctis in KHIII or riot. Darth Vader for secret boss. I do hope Sephiroth comes back since they're still deliberating on it. I beat him in 1, beat him in 2, and saw the story with him and Cloud play out in both of them. I want KH3 to show how that story ends, especially if Zack could get involved. Also Cloud being a party member for the fight. Don't get me wrong, I do want other FF bosses too. I just want Sephiroth back for one last round as well. I get he's just joking.. but considering the companies more recent track record, is that really something he should be gloating about? From a business perspective.. that's just bad business. How has no one even mentioned the lack of npcs in the series, especially for KH3? 40-50% is my guess. Maybe more? I suppose I wouldn't want anything to take from the original plot as it is anyway, but I hope that doesn't mean literally no new Square characters will appear? Also to be blunt, its not like people like Yuna, Rikku, and Paine were really written with much importance so I dunno why he is acting like its some difficult thing lol. I guess as long as some of the older people show up I will be fine...I want the Restoration Committee and like Vivi and stuff to show up again. Don't care about Seifer but I'm sure he will too lol. Also wait, is there a transcript of that Kairi letter from the Orchestra? I hadn't heard of that till now, I may have missed it if it was already posted. I would guess like an 80% done. Miss Yoko Shimmomura said that she was barely starting the music since she is done with the world tour. Are you referring to us or Nomura and his team? Cause we have criticized the lack of NPCs plenty of times. It has to be more that 40-50. They've been working on the game since 2013. And it should be out next year if nothing causes delay. The first 50% of game development takes twice as long as the second 50%. My guess would be 65%. Sounds like they're behind in cut scenes, shimomura hasn't done much, and big hero 6 isn't even in a showable state yet. Just people asking/interviewing Nomura, would have thought someone by now would have asked him about this and for KH3 specifically. Actually Nomura mentioned these days that BH6 it's actually in showable state and he wanted to show it during D23's trailer, but Square/Disney/wtv didn't let him do so. I thought he wanted to show it in this trailer, but couldn't quite yet?